As someone who grew up in the Southeast, I am no stranger to hurricanes and the havoc they can wreak on parts of the country. With torrential amounts of rain and high speed winds, these massive storms can rip through counties and entire states, leaving destruction and hopelessness in their wake. As a large public university in the midst of one of the largest cities in America, Tech felt a sense of responsibility in helping those affected by the hurricanes currently tearing through the southeast region, including Irma and Harvey. Although efforts to help the areas affected are still underway, Tech was able to implement helpful initiatives such as handing out free tickets to those displaced by the natural disaster. Through the Jackets Without Borders program, nearly one thousand tickets were given out to those who found themselves in the Atlanta area. The program is a recently created student-athlete initiative that aims to disperse student-athletes into the world to make a difference in the lives of those around them. This past summer, Jackets Without Borders took off on a trip to Costa Rica with the goal of building a multipurpose athletic court with an organization called Courts for Kids. The program was implemented by Athletic Director Todd Stansbury as part of the Total Person Program within the Athletic Association, which aims to aid student-athletes in their growth into well-rounded people. 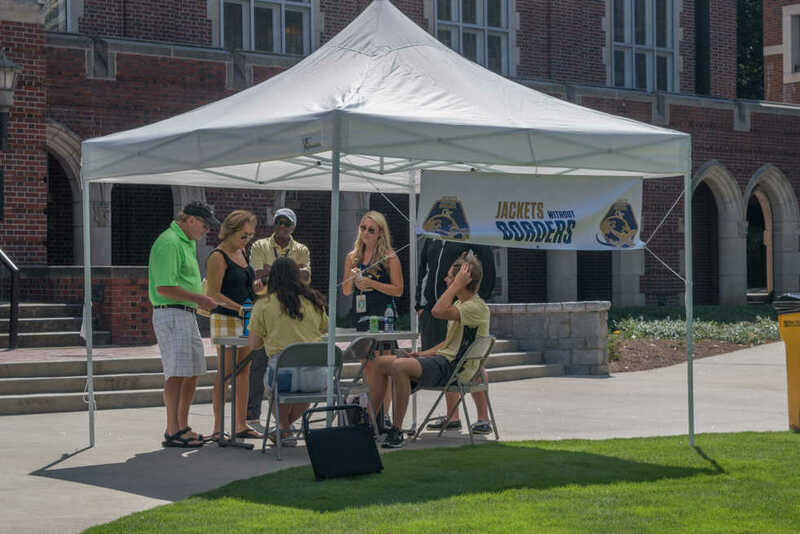 The Jackets Without Borders program is led not only by Stansbury, but also by Leah Thomas, who spearheads the Total Person Program, as well as Associate Athletic Director Joeleen Akin. Both programs work to give back to the communities that may not necessarily be as fortunate as those to which Tech students and athletes are accustomed, while giving athletes a chance to expand their experience in volunteer activities and use their influence for good. On Saturday, the Jackets played Jacksonville State University, a smaller Division I school from Jacksonville, Ala. Faculty from the athletics department, as well as members of the Student Athlete Advisory Board (SAAB), including myself, worked to distribute tickets to those wishing to attend the game that had been displaced by Irma. All we asked for was a valid piece of identification that linked a recipient from each party to Florida, Georgia or South Carolina. Although there were a few people who chose to cheer on the Jackets by themselves, most showed up with family, some with small children in tow. It was rewarding to give the children the opportunity to experience, for some, their first college football game. The day was bright and cool, with a bit of a breeze that made for nearly perfect gameday conditions — a far stretch from the conditions which the families were fleeing. As tickets were passed out, I had the opportunity to speak with some of the families about where they were coming from and their journey from their homes. Some had traveled for as long as 20 hours due to the traffic coming from Florida up the coast as the whole state evacuated. To hear the length of time that many families had traveled and sat in traffic gave me a new perspective on “Atlanta traffic,” which itself is renowned. It is one thing to sit in traffic daily due to congestion while traveling to work or to run errands, yet another to experience complete standstill while not knowing what is going to happen to your belongings and those you know from the place which you are leaving. It was intriguing to realize how many Tech students had connections to those affected by the hurricane, as students were bringing friends to our tent to receive their tickets. Even in times of need, college students find a way to band together and create fun experiences for themselves. Tech alumni also reached out by donating season ticket seats and spreading the word of the charitable event amongst their networks. The distribution of free tickets to a collegiate football game was gratifying, yet there is more that we as a population can do as a whole. Within the upcoming months, various groups at Tech will be working to collect items and money to send to those affected by the natural disasters, so keep an eye out for those opportunities to reach out to those in need. The athletic department is working to organize a drive of some sort in accordance with the student body and will be looking to send supplies or donations in the near future.